Credit to Greg Groogan and Fox 26 for having the audacity to air this story last night (pasted below) about the single-most important challenge facing our city on Dec. 3, 2015: THE CITY’S PENSION CRISIS – click link to see video). As you watch this story, remember that, on March 6th of this year, Sylvester Turner stood up with Mayor Parker – who endorsed him on 12/3/15 – and declared he was heading to Austin to solve this problem. Of course, Mr. Turner frequently cites his experience and connections in Austin as a selling point for his candidacy, and Mayor Parker made special mention of that yesterday during her endorsement. So what happened when Sylvester rode into battle to save our pensions in Austin? Well, his colleagues thought so much of Sylvester’s “leadership” that his bill never even made it to the Texas House floor. Sylvester had his moment. He failed. Bear in mind, Sylvester carried the original legislation for Mayor Lee P. Brown – who endorsed Sylvester earlier this week (there’s a trend here) – that created this pension crisis in the first place. Sylvester’s unique brand of “leadership” helped create the city’s pension crisis, and his failed attempt to fix this mess – his mess – would have made the problem even worse had it passed. Houstonians cannot afford another four years like the last six – but that’s exactly what we will get if Annise Parker’s candidate carries the day. It’s time for people who believe in good government to stand up, get out and vote, and save our city before it is too late. Which mayoral candidate can solve Houston’s pension crisis? HOUSTON (FOX 26) – The irony was pretty powerful. Candidate Sylvester Turner pledging to solve Houston’s pension crisis while both flanked and endorsed by Lee Brown, the former Mayor experts blame for triggering the problem by bestowing unaffordable benefits. “We have acknowledged that the system is not sustainable and we are going to come up with something that works in the interest of all Houstonians,” said Turner. Here are the nuts and bolts. Analysts say Houston taxpayers will spend six times more on pensions this year than they will repairing their dilapidated roads. Even with that outlay, the City is north of $3 billion in the hole when it comes to funding it’s employee pensions, a deficit that’s getting rapidly worse. A commonly cited example – Houston Firefighters with 30 years’ service retire at 94 percent pay with the bonus of an additional, one time pay-out of up to $1 million. 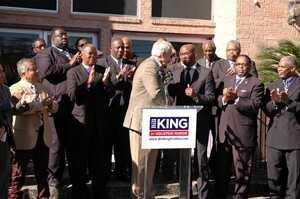 Critics like Mayoral candidate Bill King call it a formula for bankruptcy. “There were 76 firefighters that retired last year. The average age was 54. The average benefit was a distribution of a lump sum payment of $813,000 plus $58,000 a year for the rest of their life and their spouse’s life,” said King. Backed by firefighters, cops and municipal workers, Turner says only he can broker a solution, leveraging both his credibility with unions and the strength of his long-standing relationships in the Texas Legislature. “If someone puts forth a plan that does not have any buy in from police and fire it is already a non-starter okay and nothing will come about,” said Turner. “They won’t get to dictate the terms and that’s what I’m concerned with about Sylvester,” countered King. King claims salvaging the City’s financial health demands a fundamental change – moving all new hires away from pensions and into 401-k style retirement plans. honor the pension terms of all existing city employees.